THE first Arabian restaurant in Malaysia started as a shawarma bar measuring about 200 sq ft with 11 stools in Ampang Point in 1998. Shereene Abdullah, 39, who ran the business with her Syrian husband, Mohyiddin Al Halabi, 47, recalls that the business was born on impulse. A fussy eater, Mohyiddin had taken charge of the family kitchen, and on the many occasions he entertained friends with his culinary prowess, all said he should start his own restaurant. Realising their praise was genuine, Mohyiddin decided to take their advice. A favourite: According to Harun Harvey of Al Diafah in Sri Petaling, Malaysian diners can easily wolf down some 200 plates of mandi rice a day. “One day, he came home and told me he had rented a space next to the supermarket at Ampang Point and we were going into the food business,” said an initially clueless Shereene on her husband’s plans to start a restaurant. Without experience, the mother of four regarded the new venture with trepidation. “It was like stepping into water. I didn’t know whether we were going to sink or float,” she laughs. Knowing the corner her husband had rented was infamous for having past business failures did not help assuage her worries. But Mohyiddin had no time for petty doubts. Out came capital of RM20,000 for a kebab machine, griller and deep-fat fryers. Healthy demand: On any given day in Wadi Hadramawt, Arab food connoisseurs can eat up to 500 mullawahs (not all as big as this one, of course). As the mall was also where the only decent supermarket could be found then, staff from Arab embassies in Jalan U-Thant flocked to the shawarma bar like bees to honey after their grocery run. Turns out, Mohyiddin wasn’t the only one missing food from home. Today, they are known as Tarbush. They have eight outlets, no bank borrowings and are strategically located in Jalan Bukit Bintang, Sunway and recently Penang, where the company has invested some RM3mil to acquire land in Batu Feringghi. The goal is to expand restaurant operations in the Pearl of the Orient, but hints of a “Tarbush Hotel” also feature in future plans. The shawarma bar is no longer there. Taking over is a central kitchen in Sungai Besi and a 6,000 sq ft warehouse run by 20 staff to service the outlets. Says Shereene, speaking on behalf of her husband who was away on an overseas business trip, gross sales at the Jalan Bukit Bintang outlets can come up to RM15,000 on a good day. Popular: The weekend crowd at Tarbush in Jalan Bukit Bintang. Presently, they have 260 staff and a commitment of RM400,000 in monthly salaries. Humayun, the 35-year-old Bangladeshi who became the first person employed by Tarbush back in its Ampang Point days is still working in one of the kitchens as a supervisor. “When I look back, I feel it is the universal appeal of Arab food that allowed us to grow, not to mention God’s grace as we have never advertised, even till today,” says Shereene when asked about the secret of Tarbush’s success. Diners who flock to Tarbush are not only of Arab descent, but Indians, Russians, Chinese, Mongolians, Malays and Europeans. Shereene does not discount the health factor in the cuisine, which largely features salads, olive oil and cracked wheat. It also favours fresh ingredients over powdered spices. Per day, some 100kgs of tomatoes are used for every Tarbush outlet. The appetite for Arabian fare appears to be growing. 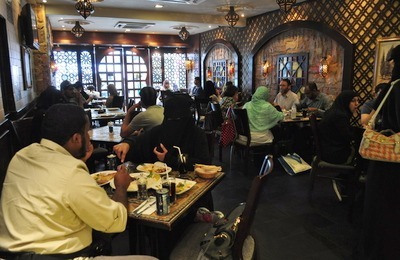 Yaser Faisal, the 34-year-old Yemeni owner of Wadi Hadramawt, an Arab restaurant chain believes there are no less than 200 Arab restaurants in Kuala Lumpur alone to cater to an estimated Arab population of 200,000. Presently, the two biggest players in the arena are Al Rawsha in Jalan Kampung Pandan and Zam Zam in Shah Alam with a capacity of 1,500 customers each. In Wadi Hadramawt, some 200 customers are served daily on weekdays and 450 during weekends. On any given day, some five whole roasted lambs are eaten with 500 pieces of mullawah (flat bread) and some 50kgs each of long-grained rice, chicken and lamb are prepared for the mandi dishes, an Arab specialty that requires hours of baking that locks in the flavours of herbs and spices. This does not include home deliveries, which can bring in monthly sales of some RM80,000. Some 20 runs a night are made by Wadi Hadramawt’s two motorbikes. 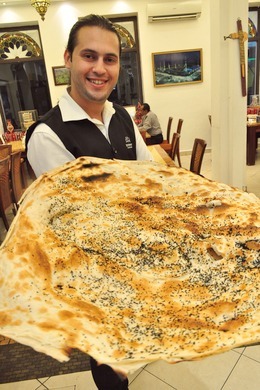 Harun Harvey, 34, manager of Al Diafah, an upscale Arab restaurant in Sri Petaling, thinks this may have something to do with the Middle Eastern tradition of lavish spreads. 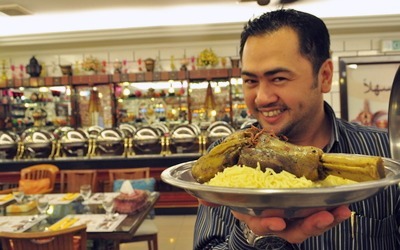 In his experience, it is no uncommon for Arab diners to share a single roast lamb among 10 people in contrast to local practices where a whole animal is normally shared among 50. But then again, in a location like Sri Petaling, you’d be surprised that only 10% of the clientele are made up of Arab diners. The majority are Malaysians who can wolf down 200 plates of mandi rice with no problems at all. However, the popularity of Arab cuisine did not come about without help from the media. In 2007 when Yaser first started, he and his team of partners spent no less than RM50,000 a year on advertising. “The first wave of Arab food enthusiasts were those who had gone on their umrah and had liked what they ate there. So, we had to go on a very strong marketing campaign to spread awareness. We invested in websites, went on television and gave magazine interviews,” recalls Yaser. For some, having prominent local partners to come on board was another necessity. In Wadi for example, where Yaser holds a 15% stake in each of its three outlets (with a total capital investment of some RM3mil), Syed Hussein Al Attas, a prominent political writer known as “Pak Habib” sits in one of their nine investors’ chairs. With the help of local backing, Wadi Hadramawt would land one of its biggest catering contracts with F1 in 2011, serving up to some 14,000 people in the week-long event. For Al Daifa, it was the helping hand of Datuk Abdul Mutalib, the retired non-executive chairman of Media Prima, who brought the restaurant’s name to the masses via programmes like TV3’s Jalan-Jalan Cari Makan. The rise of Arab restaurants was not without drama and one of the most endearing stories can be found in Sahara Tent, one of the early pioneers who has grown to four outlets in Jalan Bukit Bintang, Shah Alam, Putrajaya and Jalan Ampang. Flashback to April 2001 when Iraqi businessman Ala Salih, now 54, first opened the doors to Sahara Tent at the ground floor of Jalan Berangan’s Fortuna Hotel, an area infamous for vice, drugs and beggars. Thugs came into the restaurant and propped up their legs on the table. Child beggars tried to scam money from his customers and unscrupulous cab drivers took his guests, living in hotels just a few doors away, for a round-the-city ride that translated to exorbitant cab fares. Recounting how he once tried to offer a teenage beggar a job, Ala said the young boy retorted he could easily make double the pay by begging. Determined to do his bit to clean up the area, Ala worked to fill his reservation book with names from Kuala Lumpur’s high society, figuring that with such a high profile crowd, the authorities would have to beef up security. One day, who should turn up but former Prime Minister Tun Dr Mahathir Mohamad. Ala wasted no time in airing his grouses. This gave rise to the transformation of Jalan Berangan into Ain Arabia (Arab Street) in 2005, a move that would temporarily rid the area of crime. “We had an Arabian mini market, another budget restaurant, a laundry and a barber — all catering to the Arabian tourists in Ain Arabia itself. “It was to be a home away from home. In a day, Ain Arabia saw up some 200 visitors,” recalls Ala of the time when he was the “emperor” of this enclave. However, Ain Arabia would not last and as the lease with the hotel expired, and with expanding outlets to oversee, Ala moved operations to the main street, where customer traffic was higher. Though the barber and laundry shops have long gone, the Arab-themed sculptures in the playground remain. Looking back, Ala’s only regret was not buying the building that once housed his other restaurant, Hay Al Arab, when the owner wanted to sell it for RM2.2mil. Now, it’s worth RM5mil. But the Iraqi who came to Malaysia as a bachelor has more things on his mind now, having married a Malaysian. They have a three-year-old son, and now Ala says there is more to life than just work. Now comes the question of what the future holds for Arab restaurants. Will the trend peter out or will the names above be around in the next 10 years. An experienced restaurateur of 30 years, Ala says that freshness, taste, service and crucially, hygiene, remain the core tenets of the food industry, may it be Malay, Western, Indian or Arab. “No restaurant can survive just by selling food alone. You need to package it with ambience and experience. “That will take you a long way,” concludes Ala.